For years David and I have struggled to fit in family devotions in the evenings. It seemed like we could never get into a routine — David usually works until 6, and then we’re rushing to get dinner on the table and rushing off to various meetings, scouts, practices, etc. We just never hit our stride, and it was frustrating to both of us. 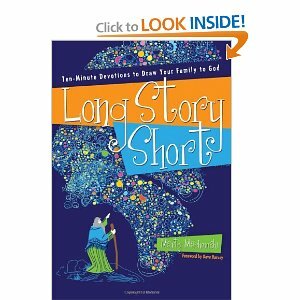 Long Story Short is an 18-month study of the Old Testament that points forward to Christ. It has been a great structure for us to follow — simple, well-thought-out, and to-the-point. But more importantly, we decided to unflinchingly turn our schedule on its head. Instead of trying to squeeze devotions in at the end of the day when everyone is tired and feels pressed for time, we instituted morning family devotions. Every weekday, while David gets dressed for work, I run around and drag children out of bed and make sure they are on the couch pretty close to 7:00. That may seem late to you regular-school people, but my kids are not used to getting going that early. It’s one of the many perks of homeschooling — sleeping in a little later than the rest. But no more! We are getting up and getting into God’s word before the day slips away — even on summer vacation! This entry was posted in links, mothering, reading. Bookmark the permalink.